There were Doves pooping all over the place, and now today the Uber-Update news has been revealed. For those who don't know what that is, an Uber-Update is an HUGE update, its a huge update which will comprise of new weapons, maps, hats and more hidden goodies that the people of Valve like to tease their fans with, you will have to find them though and its an open secret. This link is also the official page for the update so keep an eye on it. The first update is for the first class pack announcement, named "Mobster Monday"
The third and final day of the update is here and this time, there only the one who has gotten special attention, the Soldier, the class I play the most. Three new weapons have been added to the Soldiers arsenal. 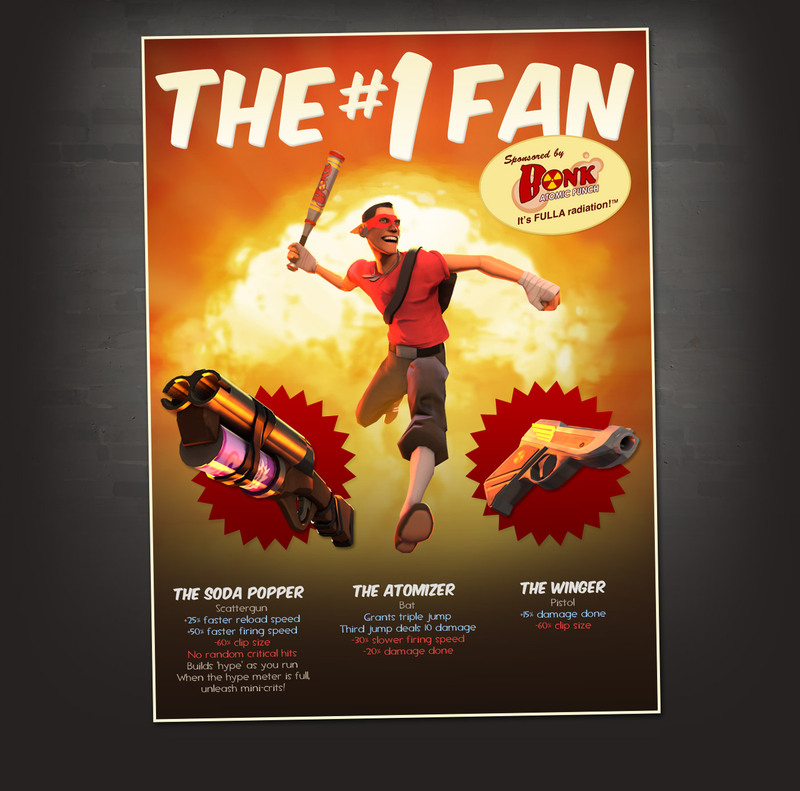 But there was also hidden page which I found that revealed a new Weapon for the Pyro. Here it is.. The second day of the update draws close and concentration has been put on the Sniper, the Scout and the Demo man, each class has been given three weapons, except for the Sniper who has been given just the two weapons and the hat. Below is a list of weapons for each class. Expect these on drop's and also be available for crafting. The Sniper has been given a more "Lawrance of Arabia" feel and the Demo has been given a "Persian Warrior" touch with the whole Middle Eastern feel to it and the Scout has been given a radiated super hero touch, I figured must be from the new Captain America movie. More details below. Find below a link that directs you to the Weapons for the Sniper and the Demo man. The Scout update was hidden, as always Valve likes to tease its fans by hiding stuff and rewarding them when they find it, the weapons look really cool and Valve is putting in some real effort in designing these for the gamer. I think these will end when they release the final "meet the" video which will be for the Pyro in the future, so enjoy it till it lasts, because there is only one character left after which I doubt there will be any such huge updates, the ability to mod and create user content and Valve selling the maps/weapons made by gamers and also paying royalties for those might encourage some user based content but not by much. Here is the link to the Scout update. Cheers. This update will include another "meet the" short video, seeing as there are only two characters left to make video's on, the Medic and the Pyro. This video will be about the Medic. The update is due out Thursday the 23rd of this month. That and they have a WEEK long FREE weekend, starting today, so you can download and play the game for FREE for a whole week starting today. So, invite your friends and jump into a quick game. If you missed out on the earlier videos, here you go. The last video was "Meet the Spy" which came out in 2009.